Chelsea captain Cesar Azpilicueta reportedly confronted manager Maurizio Sarri about the row between him and goalkeeper Kepa Arrizabalaga. The Spanish shot-stopper appeared to refuse to go off in the Carabao Cup final, and it seems Azpilicueta sided with his team-mate over his manager, according to the Telegraph. Kepa has had a mixed first season at Stamford Bridge since joining the club in the summer, with these antics in the cup final undoubtedly the stand-out moment of his Premier League career to date. 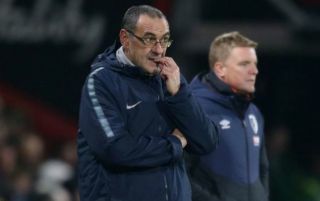 Still, despite this apparent lack of professionalism, he had the support of a number of Chelsea players, led by Azpilicueta, who argued against Sarri for his colleague, according to the Telegraph. The report also claims the pair are close with Spanish duo Pedro and Marcos Alonso, suggesting these may be a clique of players against Sarri, while the likes of Gonzalo Higuain, Jorginho and David Luiz are listed as his supporters. Overall, this looks very messy for Chelsea and fans won’t be at all happy to see what their club has become this season.